Here is my number-one cleaning tip: Hire a cleaning lady! OK, I know I know, I’m in Hollywood and I’m so rich I can afford it, right? Um . . . think again. I shop at the dollar store for my produce and milk too. The thing I learned is this: I’m a full-time working mom. I realize that hiring a cleaning service can seem like a luxury to some of us. But I had to think about the value of my time. 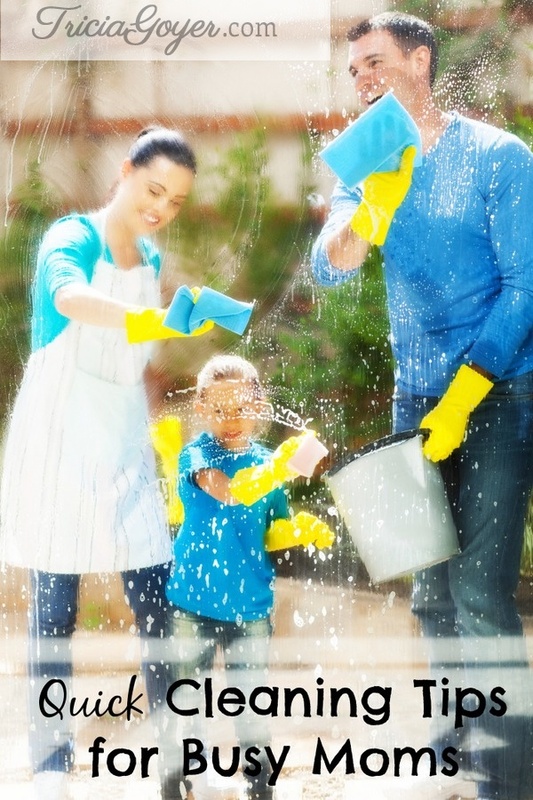 What is the value of the entire day it takes to clean my house when I’m comparing it to time I could be spending with my kids or doing the work that needs to be done? What are your quick cleaning tips? Share below in the comments! When cleaning up the living room or any shared family space, to keep yourself from making multiple trips to multiple rooms to put things away – and if you are lie me keeping yourself from losing track of what you were originally setting out to do – use boxes, platstic bins, or laundry baskets (my personal favorite), to divide what items need to be put away into which room … all at once. (I usually have one basket apiece for each of my two kids, another for the bathroom as towels tend to wander in my house freely, and another for kitchen stuff for random cups or trash etc.) This will save you tons of trips and keep you focused on the room you actually set out to clean. I use a plastic carrier with divided sides and a top handle, you know the type. I keep all my cleaning supplies in it. Furniture polish, window cleaner, bathroom scrub, rags, paper towels, etc. I carry it from room to room and always have the supplies I need close at hand. My quick cleaning tip is to use magic erasers. Mr clean is the best brand. takes marker marks off most things including walls. If you have a particularly tough one on plastic, take another marker and scrub over the old marker stain and it should come right out then use the magic eraser. why keep scrubbing with water and detergent when this is quicker? My quick cleaning tip is to use magic erasers. Mr clean is the best brand. takes marker marks off most things including walls.